Prepaid Online® New Prepaid Cellcom multi size sim card size activated and ready for use, including: sim card holder + Iphone pin + user guide in English, The SIM card will stay valid forever if you use the sim once every 2 years. works with any unlocked mobile phone, tablet or modem, use your personal phone when you travel to Israel, You can refill the sim card add credit (topup) online on our website or in Israeli shops for Calls, SMS, cellular Internet and calling abroad. instructions for activating the 30 day plan is included in the package. To change the sim card size pop-out the middle part of the sim card. 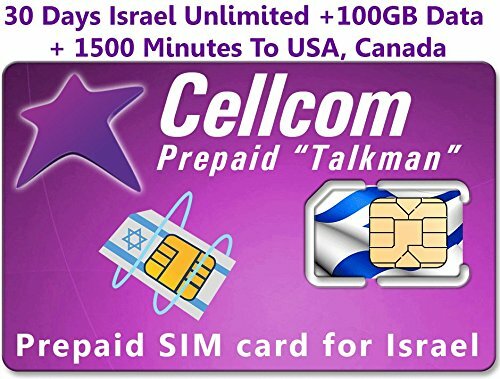 Prepaid Online® Israel Prepaid SIM card from Cellcom♦ including 30 Days Unlimited Calls and Text in Israel + 1500 Minutes for Calls to USA / Canada + 100GB Data + 75 Shekel credit to pay as you go for any service that is not included in the plan. Triple SIM, Combo sim, Multi Size SIM 3 in 1 sim card to fit any device, mini sim, Micro sim, Nano sim ♦ Works with any unlocked device ♦ Incoming calls and text is always free ♦ The sim card will stay valid forever if used once every 2 years. Activated and ready for use ♦ Includes Local Israeli Phone Number (052 Prefix) ♦ Good Coverage nationwide. 3G and 4G LTE. You can always refill the sim card in Israel or online for a new plan ♦ The package includes a sim card holder Iphone pin ♦ Instruction guide in English ♦ works ONLY in Israel. Do not use your USA sim in Israel for roaming or signup with any phone rental company !, Stay in control of your payments and save ♦ Prepaid is the cheapest solution for travelers ♦ Have your own permanent Israeli phone number and refill every time you travel to Israel ♦ The sim card will stay valid forever if used once every 3 years, We offer lifetime support in English for the sim card. If you have any questions about this product by SIMCases, contact us by completing and submitting the form below. If you are looking for a specif part number, please include it with your message.